When you first arrive to the Udun Foothold encampment (41.2S, 0.5W) in Udun you will have the opportunity to start a quest called “The Ash of Gorgoroth” by chatting with an NPC named Narthavron (41.4S, 0.5W). 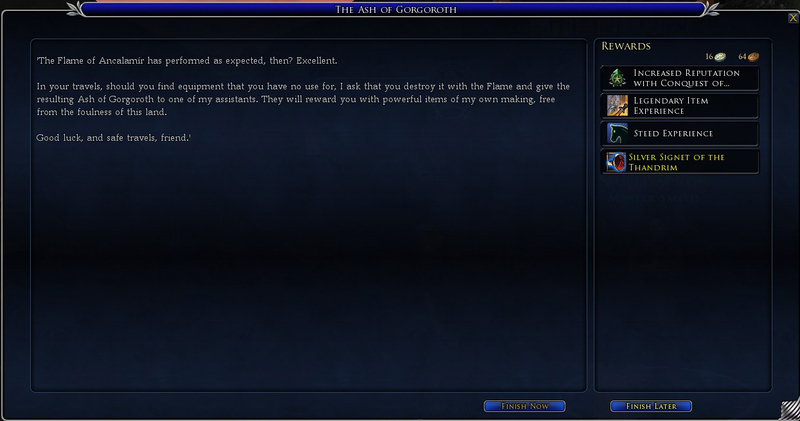 Once you have the quest you need to chat with the High-Enchanter (Elf-Smith) standing beside Narthavron and “Browse the Shop.” Purchase a Flame of Ancalamir (34s 80c). Talk to the NPC Finnoth Sharp-wind (41.4S, 0.7W) to continue the quest. As instructed, use your Flame of Anclalmir (by double clicking on it in your pack) on the Morgul-steel Dagger (also in your pack). Using the Flame of Ancalamír with the Morgul-steel Dagger. You have acquired: [Ash of Gorgoroth]. Before you (sp.) eyes the dagger crumbles into a pile of ash. Go back and chat with Narthavron to finish the quest. 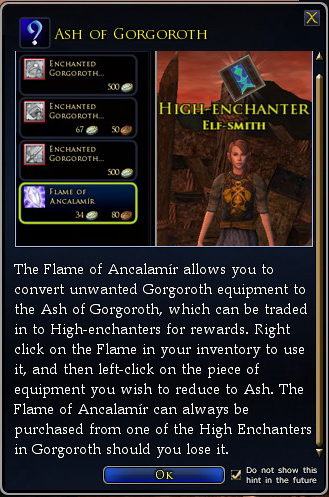 You can now deconstruct most of the new gear you get in Mordor in to Ash of Gorgoroth by using your Flame of Ancalamir on it. Simply double-click the Flame and then click the item you want to deconstruct. Why would I want to deconstruct it??? Much of the gear you get via random drops and loot will be Bind on Acquire (only the character that received it can use it). 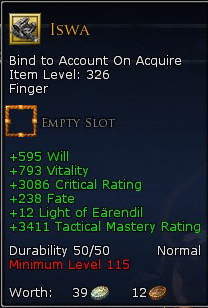 If you are a Guardian and you receive a piece of Will based gear you likely will not want it. Rather than vendoring it this system allows you to build toward a piece of gear you do want. 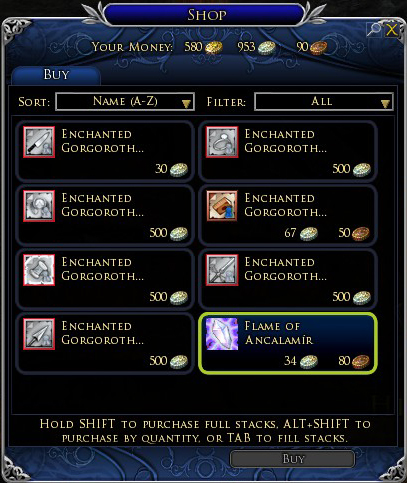 You can use recipes (buy them from the High-enchanters for 475s each) to craft Enchanted Gorgoroth Adamants. The non-crit version gives you one adamant and the crit version gives you two. Each adamant can be deconstructed with the Flame of Ancalamir for 10 Ash of Gorgoroth. Note: you must have Westement Master of the Guild standing and unlock the Doomfold crafting ability to use these recipes. 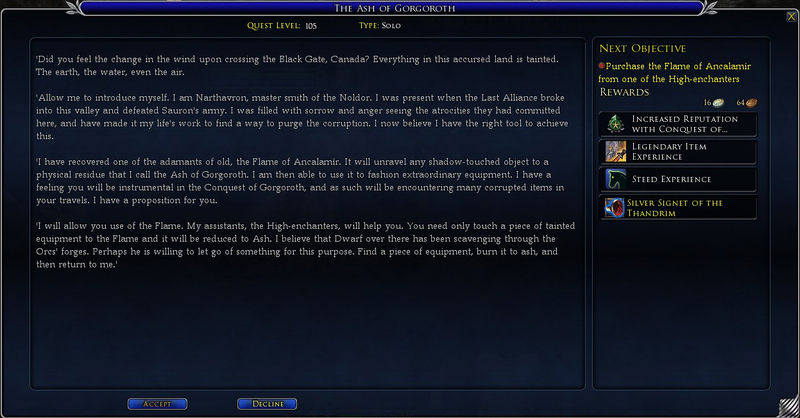 Once you start collecting Ash of Gorgoroth you can speak with any High-Enchanter (Elf-Smith) in Mordor and then barter with them. There is some really nice gear available !!! You can get gear anywhere in Mordor (landscape mobs, quests, etc. all drop it). 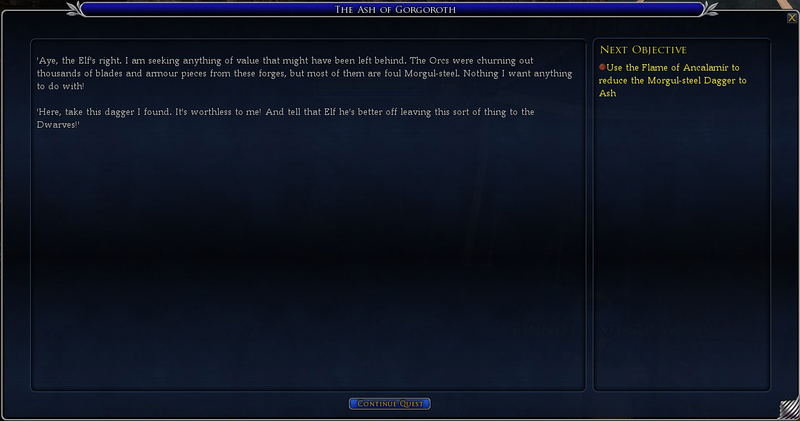 At this point only Bind on Acquire Armour and Jewellery pieces can be deconstructed.